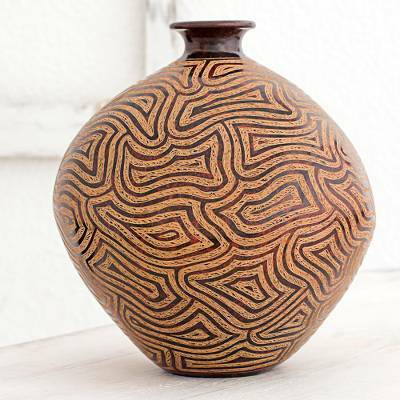 Handcrafted Decorative Ceramic Vase with Geometric Motifs, "Expansive Thoughts"
Concentric geometric shapes flow beautifully across the surface of a voluptuous decorative ceramic vase. "Their distinctive qualities are all based on a single shape," Victor Barrios confides. The Nicaraguan artisan works in terracotta, shaping his design by hand on the potter's wheel. He obtains the colors from ground rocks and mineral oxides, and polishes the vase with the seed of a sapote fruit. 21 cm H x 20 cm Diam. 8.25" H x 7.75" Diam. Victor Barrios has received 2 microcredit loans with 0% interest from Kiva and Novica, the first for $100 and the most recent for $150. "When I was 15, I observed how my cousin crafted pre-Hispanic items like how he created pre-Hispanic motifs." "I'm Victor Barrios and I was born in Nicaragua. My parents worked the land all of their lives and my grandparents were artisans who created earthenware items like pots, pans, jars and plates. This earthenware is known as utilitarian ceramics, as they are used to cook and serve food. "Many years ago, people ate from earthenware plates because we had a tradition of creating and using ceramics, while other villages used banana leaves as plates. Then the people in those villages began to buy our plates for their homes. "When I was 15, I observed how my cousin crafted pre-Hispanic items like vases, and how he created designs like Mayan gods, priests and other motifs. When I became interested in this craft, I started to work with him. The first thing I did was mold the clay to make a vase and then I added pre-Hispanic motifs. "My early pieces would usually break because I didn't have experience mixing sand with clay to give them the right sturdy texture. After I mastered that detail, I created other pieces as a test and fired them without applying any designs to see if any would fail. I was encouraged when they didn't break. and again began to apply decorative motifs. I was overjoyed because it was the first time my designs came out right. "My designs are inspired by my family and community. My family works with me and I consider my assistants part of the family as well. Because I wanted to give the same recognition to the designs as to the artisan, I decided each person who creates a piece should sign it because it's that particular artisan's personal work of art. My team members are very proud of each piece they create. "I hope you like my work and I appreciate the opportunity to share our ceramic traditions with the rest of the world."